Nimble CROSSWIND drive hub torque pins. These pins (in sets of three) are placed between CROSSWIND compatible hubs and CROSSWIND wheelbodies. They transfer the rotation power from the drive of the cycle to the wheels. These pins are used with driving hubs only (rear hub and track hub) and not used with the front hub or handcycle hub. These pins are included with every driving hub and with the CROSSWIND spare parts kit. They are steel, 3mm x 14mm. Nimble CROSSWIND spare parts kit. 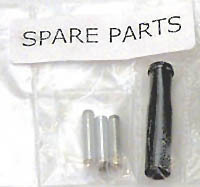 The pins described above and a valve extender are included in our CROSSWIND spare parts kit. This comes with every CROSSWIND wheel and is also sold as an accessory. See pricing.